Prolific author Stephen King's sprawling multi-generational, supernatural horror story, It: Chapter One, comes to the big screen from Mama filmmaker Andrés Muschietti. The dual timeline of the 1,200-page novel has been split keeping only the earlier time period, the book's 1950s transplanted to the late 1980s when it was first published, as Muschietti has assembled a fine young cast of kid actors to explore the dark nature of childhood with strong Stand by Me (also a King adaptation based on The Body) vibes. The Losers' Club feels pitch perfect led by a stuttering Jaeden Lieberher who is forever traumatized by the mysterious disappearance of his little brother. Finn Wolfhard is an enjoyable presence but feels entirely superficial as the comic relief character. He gets the best, filthiest lines extolling adolescent humour. 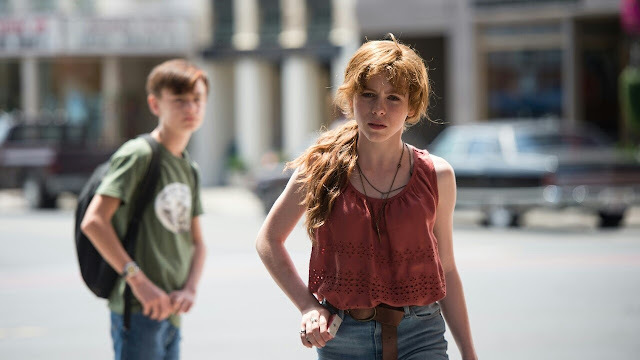 However, Sophia Lillis is an absolute star as Bev, the only girl in the group, with a stunning screen presence and messy but dramatic character arc. Jeremy Ray Taylor, Wyatt Oleff, Jack Dylan Grazer, and Chosen Jacobs round out the crew of outcasts as the bookworm, scaredy cat, mama's boy, and outsider archetypes. They have a fun chemistry together but it's not to think there's at least one too many in the group only around to have them show up as adults in the sequel. Swedish actor Bill Skarsgård is rather terrifying in full clown makeup but is largely removed. His Pennywise the killer clown is a suitable embodiment of small-town horror. Derry, Maine feels horrifying enough in its casual acceptance of child abuse. Skarsgård goes for a much more broad, intensely projected performance acknowledging the clown's heightened imagery in popular culture. He's a terrifying presence who shows up and disappears without much set up for more thrils without any laboured origin or explanation. Pieced together from earlier iterations and rewrites from a script credited to Chase Palmer, Cary Fukunaga, and Gary Dauberman, It still feels overlong at 135-minutes despite splitting the story. Occasionally, it explores more than it can possibly pay off with short detours into the psychologically disturbed but unexplained. We only get superficial glimpses of the kids' fears and traumas in exchange for more screen time from Pennywise making his appearances less suspenseful despite striking imagery from Korean cinematographer Chung-hoon Chung. Muschietti has largely succeeded in creating a portrait of small-town fear expressed through childlike imagination. Despite some difficulties in scripting and translating King's sprawling work, the film is an altogether entertaining endeavour full of coming-of-age, teen humour and frightening clown scares with just enough nostalgic charm. It feels surprisingly grounded in teenage drama despite a sometimes unclear, supernatural premise.